LFS announces Honorary Associate and ex-tutor Colin Tucker has passed away on 6 August 2018. Colin worked at London Film School as a Term Two and Three tutor from 2000 until 2004 and mentored students for several years thereafter at the School. While at LFS, Colin amongst many other roles, mentored on the MA Screenwriting programme, led by the then Head of Screenwriting, Brian Dunnigan, giving invaluable one-to-one support on feature screenplays written by the student writers. 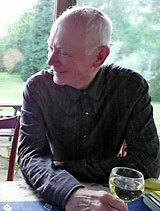 Colin also mentored outside of LFS on a professional script development programme based in Berlin called ‘Sources’. Many of the projects he mentored, went on to become successful first-time feature films. Shaped by his thirty years’ experience in BBC television first as script editor and then as a producer of TV series, mini-series and single dramas. More notably as Producer on ‘Poldark’ starring Robin Ellis, ‘Portrait of a Marriage’ starring Patricia Hodge, ‘Shadow of the Noose’ and ‘The Secret Agent’ starring Peter Capaldi. Every script is unique, and the discovery of what it is that makes it unique is essential if the writer is to achieve something of value. Work on the script must proceed from the inside to the surface. The audience perceives the surface but is moved, unknowingly, by the buried life of the film. Structure is simply a way of formalising the unique quality of a script in a manner satisfying for an audience. Every film has a structure that is particular to it, and that needs to be discovered. Films may proceed through rigid formality. They may proceed through haphazard accidents. They make contain both. There is no pre-ordained structure into which films must be fitted. The first draft is the antenna of the film; it senses and locates the basic humanity that lies inside the project. What is this film about? What is it saying? What is unique about it? Humanity, life – a good film needs little more than this as its basis. Structure is the means by which the essence of the film is delivered to best advantage. It is a technical consideration and as such should come late in the process. Terry Hopkins, ex Deputy Head of Camera and Visiting Lecturer: "Colin was always utterly honest with students, yet in a way that was, while insightful and to the point, so non-incriminating, so even-handed, that it took a bit of time to realise he was actually criticising their work - constructively of course. Colin didn’t wear his vast knowledge and wisdom on his sleeve, but he used them to great effect. He was such a good and gentle man." Moshe Nitzani, IT Manager and Staff Governor: "Colin Tucker was the perfect gentleman. I know how much he was appreciated and loved by his students and colleagues. Always a calm and collected person with a very warm welcome everyone we met after he left the LFS. He will be very missed."